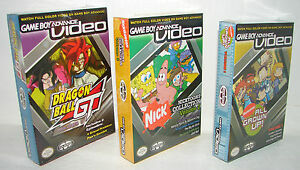 Details about lot of 3 NEW GameBoy Advance Videos DRAGONBALL , Nicktoons & MORE!! Majesco's "Game Boy Advance Video" releases use proprietary technology to pack sound and full-motion video into a GBA cartridge, for playback on the Nintendo handheld. The cartridges can hold up to 45 minutes of sound and video, and feature episodes of popular Nickelodeon animated shows. Nicktoon's Collection Vol. 2 contains episodes from three Nicktoon series: "Nature Pants" and "Opposite Day" from SpongeBob SquarePants, "The Big Air Dare" from Rocket Power, and "Odd Ball" from Fairly OddParents. Fast shipping! Highly recommended seller! Thanks! My grandson is very happy with these games! My son loves this video cartridge. It is so easy to bring on trips instead of bringing a full sized dvd player. Fun little time water on the GBA Full length cartoons on the GBA. My four year old son loves this video for his Gameboy Advance system. He thinks it's pretty spectacular to view "his movies" on his gameboy. Movie looks great and works well. Came in earlier than expected and brand new. I love it.